Minor climbers must be accompanied by a parent/guardian throughout the climbing session. 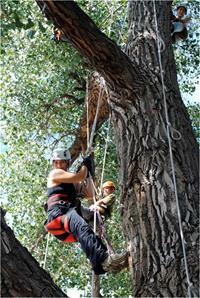 Participants ages 7 and up will climb safely on ropes into the crown of a tall tree. Experience the joy and adventure of reconnecting with nature from on high. Trained and experienced facilitators provide all the instruction and equipment. Participants should be reasonably fit and in good health. Long pants and sturdy, closed heel and toe footwear are required. Gloves recommended. Minor climbers must be accompanied by a parent/guardian throughout the climbing session. Please arrive promptly. No drop-offs. Great activity for families and single adults.